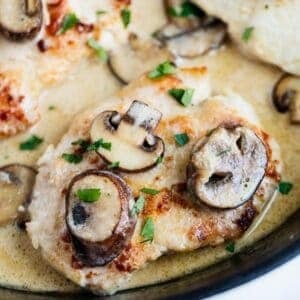 This Chicken Marsala recipe is restaurant quality and makes the perfect dish to impress your guests. It's loaded with flavor and made in one pan in just 30 minutes! Cut the chicken breasts in half horizontally to make 4 chicken fillets. Then whisk together the flour, garlic powder salt and pepper in a shallow dish. I usually add about 1/2 teaspoon salt and 1/4 teaspoon pepper to start. Then coat the chicken breasts in the flour mixture. Heat the olive oil and butter in a large skillet over medium-high heat. Lightly shake off any excess flour from the chicken and then place into the skillet. Cook 4-5 minutes per side, or until golden brown and cooked through. Add more butter if needed and then cook the mushroom for 3 minutes. Then pour in the marsala wine and boil down for a minute to burn out the alcohol. Then add in the chicken broth and simmer for 5-10 minutes. Once the sauce has begin to thicken, slowly whisk in the cream and cook until it has come to a light simmer. Taste and add more cream, S&P if desired. Then add the chicken back into the pan and cook an additional 1-2 minutes. Serve chicken over mashed potatoes, noodles or rice. Garnish with fresh parsley or thyme if desired.